Note - This article contains important information concerning the future of the Kougra that was accidentally leaked by one of the staff members at the most recent Curse of Maraqua TCG tournament competition. If it made it into the Neopian Times, it is evidently okay by the Neopets Team for everyone to me to tell the general Neopian public earlier than they had planned to release it themselves. MYSTERY ISLAND – I thought there was something fishy going on last month when the Neopets Team gave us all of that free food and drink for our Neopets and started giving out “starter” paintbrushes to new accounts. It turned out that I was right... I found out recently that they had more in mind than just trying to be nice - they were trying to get our spirits up to prepare us for one of the most tragic, unexpected events in Neopian history. When the Kougra was in its original form, people complained. When the Neopets Team gave it a makeover, people complained even more about that. Even after the Neopets Team listened, set up a vote for the new look, and retouched everyone’s Kougras according to the results (as well as hung a giant gray meteor over the planet to “help us along in liking it”), people complained about that makeover. In the end, the Neopets Team felt that the best solution would be to just get rid of the Kougra altogether and replace it with something else that hopefully everyone will like (although they thought the meteor they sent looked pretty good right there so they kept it and named it Kreludor). And so, just like old looks of Neopets in the past, we’re going to see all Kougras disappear from Neopia – from the haikuing Kougra and Grand Bogen of Mystery Island to our Kougra Neopets (which will be changed to another species) to, inevitably, all the different Kougra characters we’ve come to know in the Neopian Times. ...but that probably won’t work, especially since that’s how the Kougra got into this situation in the first place. ...which wouldn’t be a bad idea, but it really won’t be much comfort either. No, probably the best way we could get over our grief is to look towards the future. The staff members at the tournament told us that they are currently getting some new, unique species in line to possibly take the Kougra’s place. At first, the Neopets Team was going to change all the Kougras into Lupes for they feel that there aren’t nearly enough Lupes in Neopia, but then they changed their minds. They decided to replace it with a new Neopet species- a totally new and never before seen Neopet species, since they also feel that four new Neopet species in the last year was not nearly enough. Both of them will follow what is evidently going to be a trend of new Neopets being larger “adult” versions of already existing Neopets, evidently a result of the popularity of the Krawk and a past poll about whether we would like to see the Slorg as a Neopet. The first one, the staff member said, is intended to be something totally different than any Neopet that has ever existed, just like the Ruki was when it was released a few months ago, but would contain some characteristics in common with the Kougra, specifically large ears, a long tail, and a very keen eye. The Turnali Neopet will obviously originate from the woods southwest of Neopia Central. If this is the chosen Neopet, one will be put in place of each Kougra Neopet. Those people who don’t have a Kougra would have to get it through having the Petpet, just like the Krawk, and doing something like feed it pumpkin cookies. Not a surprising choice, since the Meepit is a fairly popular Petpet. However, this Neopet won’t exactly be like the Meepit we know... the Neopets Team feels the need to alter the Meepit significantly from the way it has been as a Petpet. 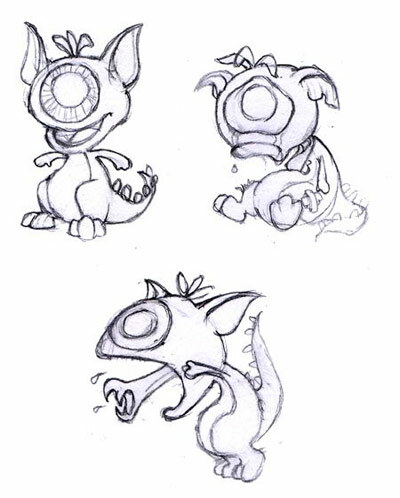 They feel that the current version is way more scary and sinister then they would like for Neopet characters to be at this time and desire the Neopet to have, among other things, much bigger, cuter eyes, and a younger appearance. All around it will be like a baby Petpet without a Baby Paint Brush. Once this Neopet is released, whether in place of the Kougra or at a later date, the Neopets Team will change the Petpet Meepit to reflect the adult. Well, there are your choices. Now before I end this article, I would like to thank the staff members I talked to at the TCG tournament for telling me and the other players this information, without which this article would not have been possible and everyone would have to learn the information much later. Yes, your Kougras are perfectly safe. Now go play with them - they’re probably hungry.